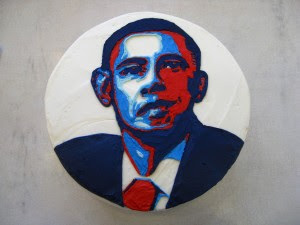 Over the last few days, I've been watching Yes We Cake and the Obama Cookie & Cupcake Flickr pool. 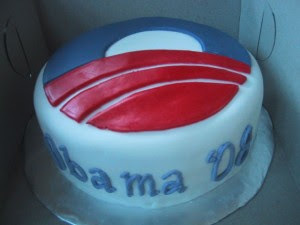 Americans expressing their political enthusiasm through baking! What could be better? I knew I'd be preoccupied today, so I decided to try my own. 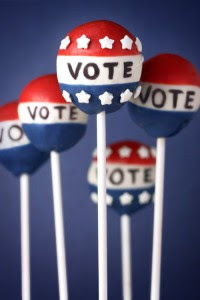 We're headed to an election returns-viewing party in a while. I hope people like them! What do you think? You can tell what they are, right?! Whatever your political views are, I hope everyone voted today, and is looking forward to a fresh start for the next 4 years. These are SOOO cute, Amy! GO OBAMA!! they turned out AWESOME!!! yum, I want one. of course you can tell what they are! p.s. extra points for making chocolate cupcakes (of course). did you see the halloween pumpkins at YES WE CARVE? So much fun!